In this Post, We will see How to Install Windows Phone 8 SDK. Before Installing, Have a look at System Requirements for Installing Windows Phone 8 SDK. 1) Windows Phone 8 SDK Offline Version (1.6 G.B.). 2) Windows Phone 8 SDK Web Version. I am going to install it using Offline Installer. Before Installing, Go to Control Panel-> Programs and Features -> Click on Turn Windows features on or off. 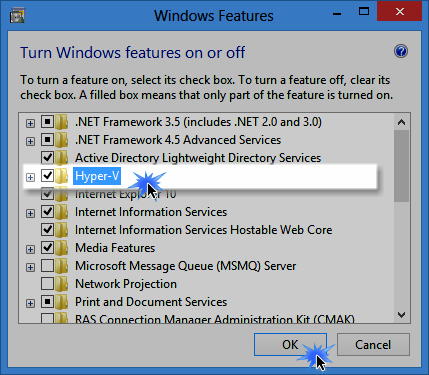 Install/Turn on Hyper-V.
Now Extract/Mount the .iso file of Windows Phone 8 SDK. and Double Click on WPexpress_full.exe and Install it. 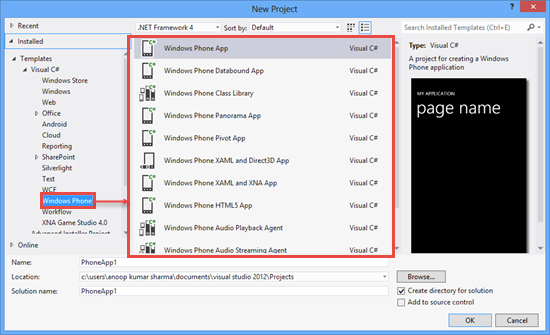 After Successful Installation, Open Visual Studio -> Click on New Project -> Under Windows Phone Template, You will see Windows Phone Application projects.